More and more Universities are using digital advertising to create an impact on student recruitment. While it is easy to setup, without a focused strategy it can be money poorly spent. As more and more Universities and Colleges use digital advertising channels it is also getting costlier each year. So an approach relying purely on outbidding competitors through pay per click is no longer going to work. Here we've consulted with our own thought-leaders and clients to compile a collection of advice that will help any University or College get the most out of their campaigns. 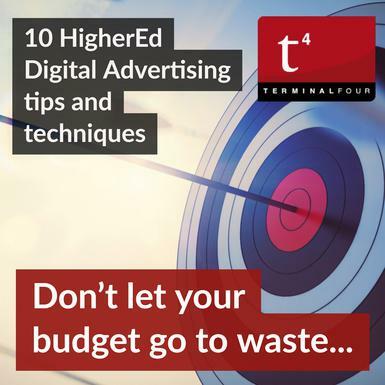 Take a look at these 10 tactics and techniques, and see how many are applicable to your institution's digital advertising activity. Advertise throughout the student recruitment cycle, not just around application deadlines. Students begin researching institutions, logistics, funding, accommodation and courses at various times in the year so you must maintain a presence to move them through the stages from awareness through to conversion. Do include investment in institution (brand) name terms if your University name revolves around a location, such as a city name. This feels counterintuitive but is important for end users. It also defends brand terms from competitors who might also bid on terms which include your institution name or location. Google goal tracking should be set up to track conversions over time for campaigns at a granular level. Remember click through doesn't equal conversion so analyzing the contribution of different campaigns and different channels to traffic and to actual conversion metrics is important. Monitoring your social and search accounts daily is also worthwhile to fine tune and optimize campaigns. Bring in an expert to help if you do not have the in-house skills. Bid on similar terms to your main target phrases. Not all students know exactly what they're wanting to search for so bidding around your target key phrases can result in further relevant traffic. If targeting international students remember some English words are spelt differently around the world. Traffic estimation and cost per click can inform the decisions. Most institutions will have historic geographical application data for each course. You can use this laser focused data to geo-target ad campaigns. By doing this you can increase budgets for regions where you know applicants have historically applied abundantly from and also successfully target new regions you need more traction in. Don't get carried away with newer digital advertising channels if the click through and conversion performance is higher on established platforms. The performance data will provide you with sound decision making. In the absence of data you can step into new channels incrementally with small experimentation budgets to guide your decisions. The institution can get a high return from retargeting campaigns. Retargeting can be implemented in a number of ways, for example, to target people who visited the website, and also to target prospective students using data extracted from your CRM. These techniques enable you to direct personalize campaigns to students at different stages of their journey towards conversion. Don't just retarget all users with the same generic message. Bing is often overlooked as it only accounts for just over 2% of search traffic. But this is still a significant number of searches each month. And because other institutions may be overlooking the potential of this channel it can be a good source of relevant traffic and good value for money. Your competitors will likely be in the decision making sphere of your prospective students. Competitor targeting can be highly effective when combined with course phrase targeting as it raises your visibility with relevant prospects. Video advertising on YouTube as well as animated and video ads across display and paid social campaigns is highly effective due to the raised cut through potential. The resource requirements can be significant if your campaigns have a large number of variants but animated and video content is proven to gain more attention than static ads. As digital advertising techniques continue to develop, we're seeing more Universities implementing their own sophisticated and unique strategies either in-house or through third party performance marketing organizations. 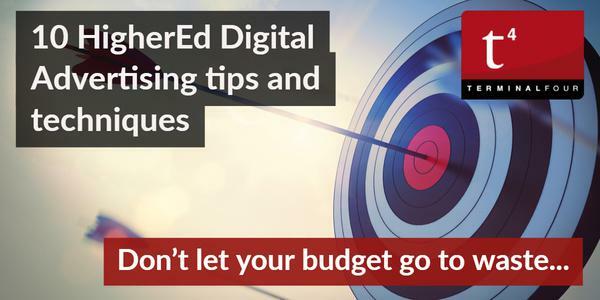 Does your institution manage your digital advertising activity in house or using an external supplier? And how do you assess the relative contribution of digital advertising versus other digital marketing activity? Is your institution's digital advertising and other digital marketing activity successfully integrated?